Concrete Countertop - Must knows about having a countertop built with concrete. The decision about installing a concrete countertop versus granite, marble, corian or laminate can be a difficult one if you don't have all the facts and answers to your questions. This page and section will help you answer those questions and help you make an educated decision if concrete is the best material for your countertop. A countertop built with concrete offers many design options to you, the homeowner, that other countertop materials just don't deliver. The flexibility and versatility of concrete allows for many different shapes, curves, colors, finishes, and overall appearances. Concrete counter tops are hand crafted, which makes each one unique, and virtually impossible to duplicate. That's one of the attractions compared to laminate, marble or granite. A polished, very high gloss, or lower gloss matte finish can be achieved using diamond pads and an electric hand polisher. Coloring the mix, staining the concrete, adding glass and different aggregates are other design options that separate using concrete from more traditional materials for counter tops. A concrete counter top is either poured in place on site or precast in a shop. The average thickness is 1.5 to 2.5 inches, but can be thicker if desired. Concrete counter tops are quite heavy, a 2 inch thick counter top weighs 25 pounds per square foot. Having plenty of help when moving and installing the counter top is a must. Most cabinets are designed to hold the weight of a 2 inch thick concrete counter top. If you decide to make it more than 2 inches thick, check with the manufacturer or add extra support to hold the added weight. 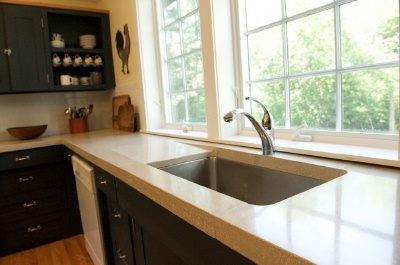 Concrete counter tops are considered "greener" than other types of counter tops. 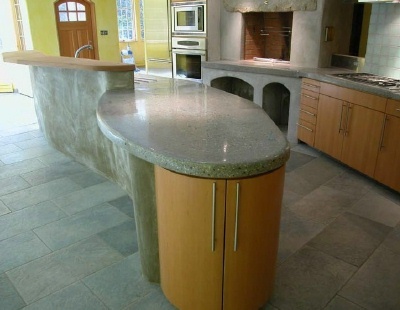 A concrete counter top is made from sand, rocks, cement, and water. Other counter top materials use plastics, resins, and synthetic materials not considered "green" by any standards. A custom made and designed concrete counter top allows the owner to be involved with what the final outcome will be. Adding your personal taste to such an integral part of your home will give you the satisfaction you deserve. If you're thinking of making a concrete countertop, I'll show you the tools and supplies you need to make your countertop.